AP EdCET Result 2018 will be declared by Sri Venkateswara University, Tirupati on behalf of APSCHE. The result of the AP EdCET 2018 will be available for candidates as per schedule. The result of common entrance test for admission in B.Ed. Regular Course will be declared after the successful conduction of entrance test. 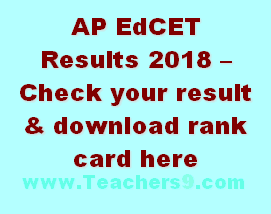 Get here complete details about AP EdCET Result 2018 from below. The Result of AP EdCET entrance test result for B.Ed course will be announced on the official website.